From Pops, and from the Bellingham Theatre Guild, which I miss. 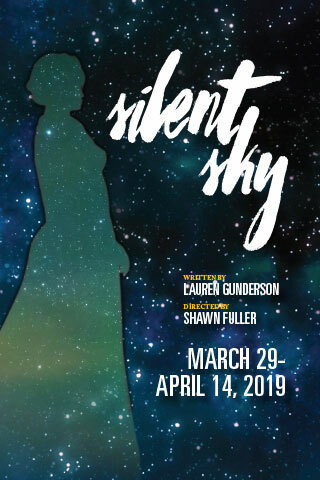 In its 90th year, the Guild does a great job with Silent Sky, a 2015 play by Lauren Gunderson in San Francisco, “an Arts meets Activism writer… currently recognized as America’s most produced living playwright”; she has written many about unappreciated women in history. It was very well done here by a cast of five; great dialogue well-played, and engaging characters to tell this story of Henrietta Leavitt, who worked as a menial-labor type ‘computer’ for a famous astronomer before making the groundbreaking discovery of ‘Leavitt’s Law’ (circa 1910) that provided “a way to accurately measure distances on an inter-galactic scale” and ultimately allowed Hubble to describe an expanding universe. It’s hard to tell if they are getting better and better, or we are just appreciating them more. It seems to me that good play-selection is a key thing. Play selection is a huge deal, I’m sure. You also just seem to have very fine actors (and presumably directors and other behind-the-scenes decision makers), though. My failed attempt at enjoying community theatre in Asheville recently showed me what well-meaning but just poor acting can do for a play: not much good. As Egan said at that event, Bellingham attracts artists, right? Count yourself lucky! I would have enjoyed this one, I think. A synchronicity: my father sent me a recently published essay by Scott Russell Sanders that coincides with some reading and thinking I’ve been doing lately. The essay occurred in the Autumn 2018 issue of Orion, which you can purchase here, but cannot read without purchasing – sorry. It’s called “At the Gates of Deep Darkness,” and it is about the dire cancer diagnosis of Sanders’s son, Jesse, who is 40 and has young children. In it, Sanders tries to navigate grief, and the intersection of his religious upbringing with his devotion to science, his love for this world and his sadness & anger at Jesse’s coming end. It’s an essay I appreciate in many ways: for its language, its attention to detail, its careful plotting of divergent beliefs and feelings, and its place within Sanders’s body of work. 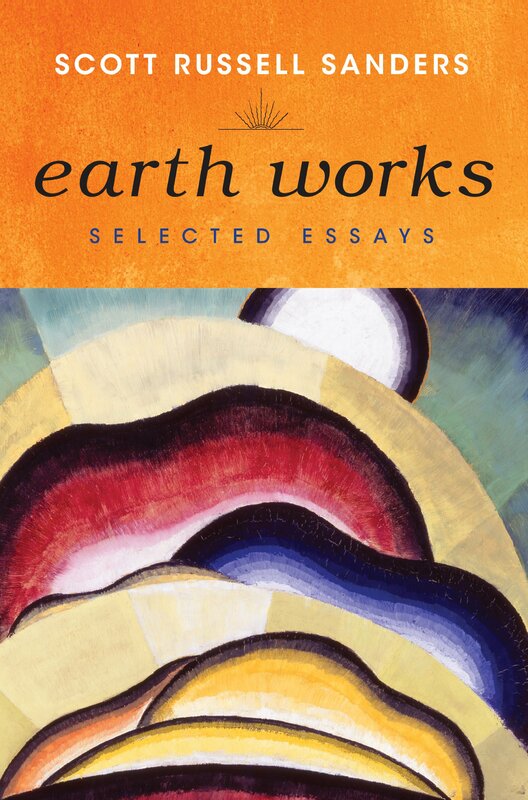 I enjoyed his listing of “great pioneers such as Emerson, Thoreau, Muir, Leopold, and Carson, as well as accomplished contemporaries such as Barry Lopez, Terry Tempest Williams, Chet Raymo, John Elder, Kathleen Dean Moore, Pattiann Rogers, and David James Duncan” – what a list! – with whom he has some things in common. I really do recommend it. But, separately, what is interesting about this as synchronicity is my recent reading of Brian Doyle’s short essay “Joyous Voladoras,” which you can read here. It was assigned by Matt Ferrence* for his seminar, and when Matt and I got a chance to talk more later, he told me it’s an excerpt (?) or vastly shortened version (?) of Doyle’s book The Wet Engine, which I have not read but of course want to. It’s about the heart – the hummingbird heart, and Doyle’s own. The book makes it clear, though, that this interest in the heart was inspired by his very young son’s need for open heart surgery. His son survived, and is now an adult, and Doyle has since died (in 2017). When my father sent me the Sanders essay, he said it “presents us, like Doyle does, with a thoughtful writer wrestling with faith in real time in public.” Pops means Doyle wrestling with his own mortality, as he did while dying very quickly of brain cancer. But fresh off “Joyous Voladoras,” I thought of the even closer parallel, of worrying for one’s child. Grief, obviously, is one of those universal topics. Sanders acknowledges, “In sharing this personal story, I do not mean to impose my grief on readers, for we all have more than enough griefs to bear, both public and private.” Even grief for a child is common enough. But for artists such as Sanders or Doyle, there is still something to offer. Sanders continues, “I tell of Jesse’s cancer because it has made clear to me the persistence of those questions, intuitions, fears, and longings that inspired my early devotion to church-going and Bible-reading. I still puzzle over the sources of suffering; I still experience wonder and terror and awe; I still yearn for a sense of meaning; I still seek to understand the all-encompassing wholeness to which I belong.” And onward. This is why we read, and this is why we write. My calling of Jesse’s name is timed to the rhythm of my footsteps, my breath, my heartbeat. A mother’s heartbeat is the first sound we hear. Once outside the womb, we respond to that rhythm in the beating of drums, in the bass notes of music, in the iambic pentameter of poetry. The heartbeat, again, took me back to Doyle and the hummingbird heart, which comes to be everyone’s heart. The unique and the universal. Do go read Doyle – it will take only minutes, and you’ll feel so much. And consider that issue of Orion, which I imagine contains other gems than this one. Consider too the full-length Doyle book, which I’ve added to my to-do list (Dog help me). Thanks for following me on this winding path today and always. Pops is back with a review of a book from a series that, I confess, I’d largely forgotten about. Thanks for the reminder! Once again I must thank you belatedly for a book recommendation. You gave me Worlds Between from your advanced reader stash some years ago. Ah, the circuitous route we take to the books we actually read, out of the millions out there. When I had researched the series (why not start at the beginning?) I found there was just the one, earlier; so I waited. But oops, it’s not in the library. I finally got around to requesting an ILL copy, which arrived a couple weeks ago from a suburban Denver library. The brief first chapter introduces the Ojibway icon This Man, in the 1700s; his ghost is an important presence throughout, but is neglected in the second book. Early narrative is set amidst 1930’s Ireland, with poverty and social dysfunction born of English oppression, generations-old. Brian’s dark past is a torture to read; he is a frustrated hothead and severe child abuser, and is never as fully redeemed for me as the author’s attempt suggests. We observe as each of his three children cope and mature (or not), each in their own way. Maureen is a hugely powerful character (meant both literally and figuratively); for me she, not Brian, carries the narrative thread connecting all pieces. [Spoiler follows; highlight white text to read] I was betrayed and stunned when she is killed in book two; how could Nordgren do that to her?!! The dark world of the IRA, with its own conflicted and tortured history, is introduced early on and lends appropriate complexity, useful context for events in book two. We also come to know three generations of Ojibway people and history, and understand how significant it is when Brian is adopted as son of Joe Loon, immediately blessing the fish camp with seven generations of family (all of whom are ‘present’). One of Brian’s Ojibway nephews is abused at Indian School, and later sacrifices his life to ensure the camp’s success. Simon, another nephew, is tasked by Joe Loon to learn the white man’s ways to provide intelligence for the tribe; seeing ‘our’ world through his eyes is poignant. 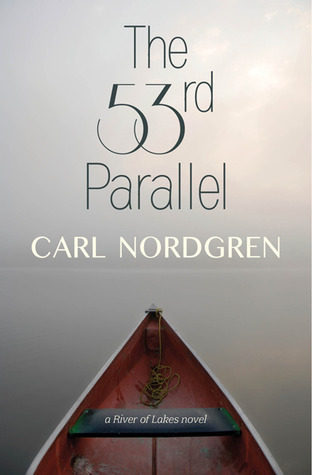 I was so impressed with Nordgren’s thoughtful treatment of the Ojibway people and story, reflecting the author’s own immersive experience in their culture. Those passages alone made these books a worthwhile indulgence; Maureen’s story added to the bounty. So good cross-cultural work–although I always wonder, how well can we judge, if we’re not from the culture being featured? I am glad for this reminder. 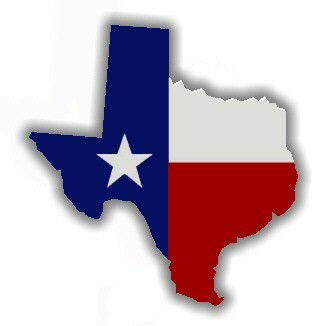 Thanks for bringing it back full-circle. I’ll expect you back again for book three, if and when! Pops is catching up with another book I read several years ago (more than five, in fact, which explains why I was so rusty in reconsidering this story). Please note that my review was spoiler-free, where this one does contain spoilers, after a break – I’ll make that clear in the body of the text, though. Here’s Pops on The Brave Cowboy. Your review covered the high points well. So what did I especially like? I too was teased by the suggested connection between Burns’ childhood and Fire on the Mountain; I really wanted to see them link up. But I read it now simply as one of those early good ideas an author grabs later and develops into a full story. I didn’t remember from Abbey such wonderful phrasing as I found here. As you note, the manhunt scenes in the mountains stand out; one cannot miss Abbey’s love of the place, reflected in his care with words. For the first time in nearly two days and nights he felt himself to be a whole and living creature, a man again and not a derelict stumbling through a mechanical world he could not understand. I was both admiring of and frustrated with Jerry; she is a character with more potential than Abbey allowed (or was capable of providing a woman character?). She was too ‘good’ for Burns (in several senses?) and with fuller explication it likely would have gone the way of Abbey’s usual dalliances. Perhaps it was best left to our imaginations. I thought Sheriff Johnson was a particularly rich character, not stereotyped as much as realistic and conflicted. He earned my sympathy as a proxy for the tragically independent but tradition-bound westerner from a romantic past, almost Stegner-like, now confused victim of the world Burns sees more clearly. He in fact has more in common with Burns than other characters. In all of his scenes, Johnson is prone to lapse into reverie, wrestling with his thoughts as others bustle about. Johnson remained for several minutes on his knees before the spring… listening, scarcely thinking, surrendering himself to strange and archaic sensations; he remembered his childhood, forty years gone, and a dim sweet exquisite sorrow passed like a cloud over his mind. waiting in the dust or blundering heavily around in the absurd labyrinth of boulders and canyons and thorny chaparral… [Johnson is] conscious of a vague annoyance… general undifferentiated social resentment of this mountain, an impatience with its irrational bulk and complexity, its absurd exasperating lack of purpose or utility… a piece of sheer insolence. Thinking about it, Johnson began to smile; he scratched his neck and chuckled aloud. He hears his thoughts mocking himself, amused at his frailty, envying Burns’ comfort in such a place. The passage ends with an entire paragraph describing the nimble tumbleweed’s path, bouncing over and around him in the wind, heading off up the canyon into the hills – like Burns. 1980: Ch. 4, the initial jail scene with lots of repartee interaction between various eccentric jail-mates. 1984: Ch. 11, where Burns returns to the Bondi ranch after escaping from jail, his rushed final interlude with Jerry. 1995: Ch. 14, a longish one, the first scene where Burns has reached the mountains, rich with description and his stalking the deer; it ends with the sheriff’s initial foray into the hills before the day-long manhunt; the two men are close and sensing each other, both knowing there is more to come. Further, from the Google Books version of Ann Ronald’s The New West of Edward Abbey (2000) I learn she has done some research for us on that connection with Fire on the Mountain. Brave Cowboy mentions the name of Burns’ grandfather in the FBI investigation: Henry Vogelin, the grandfather in Fire on the Mountain (I missed this!). The sheriff sends a deputy to interview Vogelin, but we hear no more about him. Given the gap in time between the books, I still think Abbey is just playing with us: two stories, with fun, tantalizing links. The owner of the general store near Vogelin’s ranch in Fire is Hayduke!! 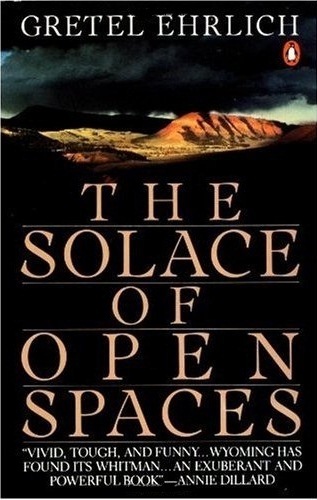 He spends too much time ‘suggesting’ and describing what we now consider typical Abbey’s themes of nature and alienation, etc, etc; quite a jarring flag of 1977 perspective. That said, he also quotes extensively from the text, including some I have already highlighted. He also reminds us of the important balance Abbey provides the story with many examples of good people with good relationships, with the effect of this sense: “There is much of human sympathy, generosity, and goodness in the world.” We see this with all the central characters, and others including Paul’s judge, truck driver Hinton and of course Sheriff Johnson. This of course begs the question of how the endings are different! From everything I can find, all copies after 1977 have the same ending as mine. So, I submitted an inter-library loan request for an earlier edition. 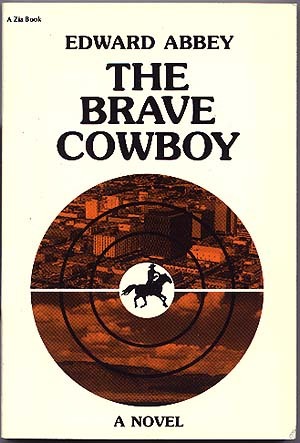 Thanks again to the library network: from little Jamestown College in North Dakota, I just received a beat-up first edition Brave Cowboy (1956) – with a handwritten notation from a librarian: “please handle with care” (I did.) Remarkably, it turns out, Abbey’s ‘revised ending’ in 1977 consisted of the removal of only one sentence, the second-last of the book, and the one that declares Burns dead. So, what of it? I found Burns’ death unsurprising; one always knows Abbey’s characters (fiction and non-fiction) face an uphill battle. Even the directness of having a modern mechanical force as the fatal weapon was to be expected. What struck me particularly was how Abbey returns us directly to Burns’ close relationship with Paul, as Burns repeatedly speaks to him in his dying stupor. It must be with purpose that Abbey balances the story of a socially-alienated cowboy-outlaw with a traditional, humanizing buddy story. Perhaps the original ending detracted from this? I appreciate your reminders. Much of what you refer to here, Pops, felt dimly familiar but no more. So many books between now and then… I have more Abbey waiting on my shelf for when I find the free time (ha). Indulgences and susceptibility to emotions aside–hey, we’re all human–this is a writer I want to return to. Thanks for this studied response.